I am finally breaking my extended fast (has it really been eight months?) from posting to this venue. While I will continue offering my thoughts and musings concerning the arts, in general, and photography, in particular, I expect to range farther from this target on a frequent basis. This post is evidence of that. A couple of days ago it was June the twenty fourth. The Vatican's calendar of feasts celebrates it as the birthday of John the Baptizer. John is also variously noted by different traditions as the Forerunner, the Last Prophet, and as the Herald of the Lamb. My own smartphone calendar buzzed an alarm in my pocket and I remembered this was my day to harvest the fruit waiting for me down at the end of our driveway. The fruit waiting to be plucked were not at all typical. So unusual they were, that I might be the lone human on the planet harvesting them. The fruit is very green, very unripe. They have the size and sphericity of a ping-pong ball. Their material consistency lies somewhere between that of balsa wood and cork. 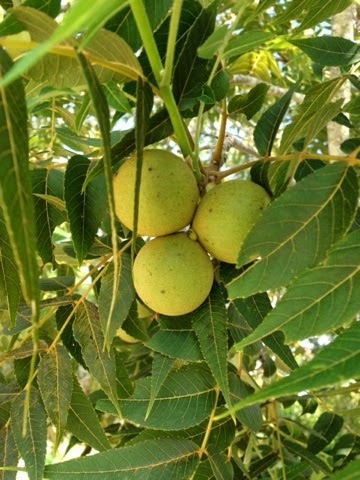 In South Texas we call the tree on which it grows a "nogalito," the diminutive form of "nogal" ("walnut"), or, "little walnut." For twenty years this little tree flourished at the edge of our Hill Country property. I say "flourished" but it neither grew fast nor tall. Having grown up in the Midwest I was familiar with the native American "black walnut" and when we moved to this property I recognized the little sapling struggling to survive. At least I thought I did. Every day as I walked down to the mailbox I passed my baby walnut tree. Every time I saw it I imagined what it would look like some day in the future. Of course, it would become like every other black walnut I had seen: majestic in stature, abundant in provision, showering my yard with shade and bushels of those pungent, sweet, delectable nuts. "Ahhhh, I can't wait" I thought. But I would have to. Trees like I imagined took decades to produce. Year by year I surveyed my little walnut. It grew, but slowly– very slowly. Would it ever produce anything? Finally, it flowered one spring and I could imagine the nuts to follow. But when the nuts formed that summer and began to fall that autumn there was no joy. I picked up one of the nuts and knocked away the drying husk from around the hard shell. My excitement faded and I felt as though some evil trick had been played on me. Inside the husk was, indeed, a black walnut shell like I had seen so often in my youth– with one exception. The hard shell on this nut was no bigger than a small grape. I found a limestone cobble a little bigger than my fist and expended the impact of its momentum upon the little nut as it rested on a much larger rock. The stone-like shell of the walnut gave under the collision and the nutmeat hidden inside was now revealed. 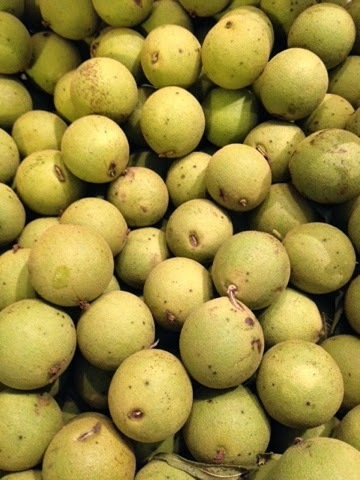 In comparison to the common English (more properly, Persian) walnut, the nutmeat in a normal American black walnut is small– maybe half the Persian's volume. But the nutmeat in the little shell I had just violated was almost non-existent: like two grains of rice. To accumulate enough of these nutmeats to fill even a little half-pint jelly jar, I could imagine it would take all of the nuts from all of the trees in a square-mile walnut orchard. And it would probably take ten man-years of labor to liberate the meats from their tiny hard-shell prisons. Disappointment abounded. Over the next couple of years, the nuts continued to show up on the little tree, which never did grow much taller (less than twenty feet). And the nuts, likewise, refused to bulk up (no more than a centimeter in diameter). What was going on here? Via the internet I began investigating the walnut botanical family. 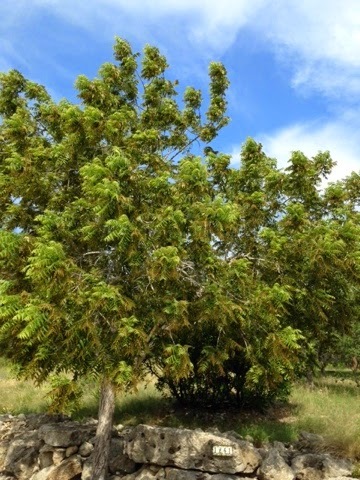 I soon discovered that my little tree was not the classic American "Black Walnut" (Juglans nigra) but a somewhat different regional species known locally and variously as the "Nogalito," "Texas Walnut," "River Walnut," or "Little Black Walnut." "Little" Black Walnut, indeed! The botanical name for the species is even more revealing: Juglans microcarpa, or literally, the "walnut with tiny fruit." The diminutive stature of the nogalito probably came about as the American Black Walnut arrived at the doorstep of the Chihuahuan Desert in southwestern Texas. The arid conditions, coupled with the lack of deep soil on the Edwards' Plateau most likely selected dwarfed forms of the tree. These miniature copies of the majestic Black Walnut would be imminently more suited to survival on the edge of a desert. A couple of years later I had acquired an interest in developing new liqueurs. In the process of educating myself about the history of liqueurs as well as their current state, I stumbled across an obscure strong drink created by the farmers near Modena (home of Ferrari, Lamborghini, and Maserati) in Emilia-Romagna of northern Italy centuries ago. The libation (actually, a digestivo) is called "nocino" (pronounced "noh-CHEEEE-noh") and is based on a grain-spirit extraction of, amazingly, green unripe walnuts. The concoction is not a large-scale, commercial liqueur that can be found at your local package store, but is only available in very limited quantities from the farmers who craft it. The recipes for nocino (also known as "liqueur de noix' in France) vary considerably, and their details are often entrusted from one generation to the next. But they typically combine a handful of diverse (and usually secret) spices and herbs with the constant of unripe, whole walnuts. The mix is combined with a high-proof grain alcohol to extract all of the aromatic oils and essences, mainly from the nut's green husk, and commonly aged for several years– the longer, the better. The walnuts are traditionally harvested on John the Baptist's feast day (Festa di San Giovanni) on June 24. Taking the nuts this early in the summer insures that they are quite underdeveloped, with the shells beneath the husks still fleshy and easily cut up with a knife. Quartering them allows the alcohol to fully penetrate the body of the husk, shell, and nut and draw out all of the wonderful nature within. Descriptions of the final liquid are near universal: inky-black in color and constitution, and possessing flavors and aromas that border on heavenly. The ink-like color is attributable to the walnut husk's chemical makeup. The compound juglone is responsible for the blackness of the liquid, and it has been used in years past for making ink, fabric dye, herbicide, and henna temporary tattoos. The FDA refers to it as "Natural Brown Dye No. 7." Who would be tempted to drink something an opaque black in color? It would not only be like drinking ink, it would, literally, be drinking ink. But everyone who has tasted nocino raves about the indescribable and unmatched flavor. As I began thinking about it, I wondered how I might get a hold of some green walnuts. They would certainly not be available at the supermarket, for one even as well-stocked as ours. And then the light came on. The little nogalito at the end of our driveway-- it grows nuts, doesn't it? And in this case, size certainly does not matter. This could be the perfect use for such a useless tree bearing equally useless fruit. Although it was already August and the feast of John the Baptist was long past, I collected an ample supply of the still green nuts. As I picked them a marvelous aroma began to fill the atmosphere. Both the nut husks as well as the leaves near them would bruise from my efforts to locate and pluck them from the branches. In response to the bruising the tree exuded a powerful aroma, difficult to describe. The olfactory effect is wonderfully fresh, yet earthy and dark. Something of the pungency of that wonderful Asian spice, cardamom, was in the background, with a myriad of other less identifiable herbs. Once having smelled it, calling up deep memories of this aroma is easy, and yet, it seems to escape being captured in words. I gathered four pounds of the nuts and then attempted to prepare them for the alcohol extraction. While most recipes describe quartering the whole nuts with a heavy kitchen knife or cleaver, the shells on these nuts were already beyond that process. The tiny nut shells inside were as hard as stone and unyielding to a steel edge. Since the details of making nocino seem to be a collaboration between tradition and improvisation, I chose the latter in opening up the nuts. I located my two-pound handheld sledge hammer and my fifty-pound iron anvil. I cleaned them both and then placed the anvil inside of a new large trash bag. Placing the whole nuts one at a time on the surface of the anvil, I struck them soundly with a quick blow from the sledge. The nut's hull, shell, and meats inside splattered vigorously inside the trash bag, leaving the anvil empty and ready to be reloaded. I carried this out until the entire four pounds had been reduced to a pulpy rubble in the bag. I moved the contents to a couple of large, bale-locked and sealed, wide-mouth glass jars (made in Italy, appropriately) and then added a mix of spices (a marriage between a traditional Italian recipe and my own secret twists) to one of the jars. I finally topped both containers by filling them with neutral grain spirits (vodka + Everclear). I placed no spices in the second jar as I had some totally different plans for it. This green walnut neutral liqueur would become the base for a whole new direction in liqueur development (another story for another time). Both jars would marinate in their own juices for nearly three months. For the duration they remained hidden in the dark, except for the one minute every two or three days when I pulled them out of hibernation and shook them to redistribute the stuff inside and enhance the liberation of goodness. At the end of three months I filtered the mess from both jars through a few layers of cheese cloth in order to separate the desired liquid from the vegetable matter. By this time the liquid had become jet black (it really did look like ink) and all of the fibrous matter was equally black and unrecognizable. I had been cautioned by all I had read to avoid trying "just a taste" of the nocino at this point. To a person, they said that it would be bitter and entirely undrinkable at this stage. I saw no reason to ignore their warnings. I could wait until its time was right. The making of a nocino is not for those without patience. Most sources say that it will only begin to be drinkable at one year. And if you can wait long enough, it apparently continues to mature in smoothness, depth, and subtlety for several years to come. But it also sounds that as it begins to become really good, not many people can keep from drinking it all up before it ever reaches the peak of perfection. With last year's nocino still a product in waiting, my new supply of Saint John's Day walnuts– all twelve pounds of them– now lie in a bag on the kitchen floor. This year's harvest from my little tree was unexpectedly larger than my initial estimate of it. This should ultimately yield nearly two and a half gallons of nocino. In previous months as I awaited the arrival of John the Baptizer's feast day I often thought about what I should call this liqueur. Although "nocino" would certainly be acceptable, it seemed that something else should grace its final label. And then it came to me. The little nogalito, while certainly not on most people's lists of "favorite trees of the Hill Country and South Texas," should receive the distinction it deserves. The liqueur, having made its way from rural Italy to rural Texas, should be christened "nogalito + nocino," or "Nogaliño" (pronounced "noh-gal-EEN-yoh"). While I prepare to crush my 360 walnuts (it turns out there are about 30 nuts to a pound) I think I will open and enjoy a bottle of appropriate wine I made last year– walnut leaf wine! Buon appetito!